On April 1, 2008, I published the following article. Here it is again, because I believe that this information needs to be in the forefront of our minds when confronting the GMO invasion of our food supply. At the end of the article is a current update on the status of the GMO takeover. America's silent killers are deadly, and do not discriminate. They target babies, the elderly, teenagers, young adults, middle-age housewives, and businessmen alike. They poison livestock, pets, and wildlife, and the people behind them deny complicity in the carnage. Who or what are these silent, deadly killers? They are the beautiful, green, uniform, and seemingly beneficial, killing fields of genetically modified (GMO) crops. The people behind them are the U.S. government, the Rockefellers, Monsanto, Dow, DuPont, and Syngenta. Henry Kissinger drafted the controversial NSSM-200 in 1974, called “the foundational document on population control issued by the United States government.” According to NSSM-200, elements of the implementation of population control programs could include: the legalization of abortion; financial incentives for countries to increase their abortion, sterilization and contraception-use rates; indoctrination of children; mandatory population control, and coercion of other forms, such as withholding disaster and food aid unless an LDC implements population control programs. In 1970, Henry Kissinger said, "Control oil and you control nations; control food and you control the people." How do you control food? By consolidating agricultural interests into what was to be termed agribusiness, creating genetically modified organisms out of heritage seeds with funding from the Rockefeller Foundation, patenting the new seeds, and making sure that these new seeds are force-fed to U.S. farmers as well as the rest of the world. By holding the patents on these seeds and requiring farmers to purchase new seeds every year, the control is complete. Also, by controlling how these GMO seeds are created, other more sinister uses come to mind. But first, you must convince the world of your good intentions. This is accomplished through lies, deception, and a bit of media manipulation. By promising farmers that this technology was safe, and would result in increased yields at less cost, they were more than happy to give it a try. The fact that in most cases this claim was false had yet to be proven by the innocent farmers that believed the lie. By the time independent studies started revealing that GMO is harmful, it was too late, and the freight train called agri-business was on its way to fulfilling its purpose - to make as much money as possible by spreading GMO seeds as far as possible, and thus gaining control of the population via food. The adoption of HT [herbicide-tolerant] corn, which had been slower in previous years, has accelerated, reaching 52 percent of U.S. corn acreage in 2007. Plantings of Bt [insect-resistant] corn grew from 8 percent of U.S. corn acreage in 1997 to 26 percent in 1999, then fell to 19 percent in 2000 and 2001, before climbing to 29 percent in 2003 and 49 percent in 2007. Plantings of Bt cotton expanded more rapidly, from 15 percent of U.S. cotton acreage in 1997 to 37 percent in 2001 and 59 percent in 2007. Take a good look at the chart above, and let's do the math. Keep in mind that all figures are approximate. 1 hectare = 2.4711 acres = 10,000 square meters. In 2006, there were 102 million hectares of land on planet earth devoted to GMO crops, or 252.05 million acres. 1 square mile = 640 acres. Therefore, by 2006, there were approximately 393,828 square miles of GMO crops. The earth's total landmass is approximately 92,229,476 square miles. In 2005, Taipei Times reported that 40% of the earth's land mass was being used for farmland. Not accounting for any increase from 2005 to 2006, the amount of land being used for farmland was, in 2006, 40% of 92,229,476 square miles, or 36,891,790 square miles, and this includes grazing land for livestock production. 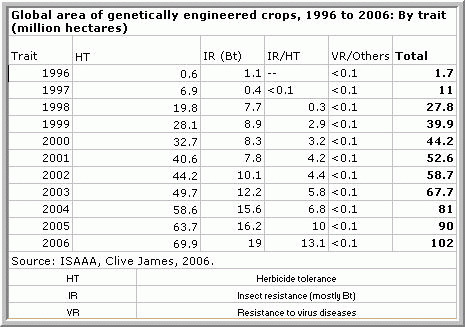 GMO - What Harm Can it Do? Evidently, Syngenta's GMO corn was deadly to a lot more than the corn borer. To make a distinction between the health effects of GMO on animals and humans is reckless at best. If rats that eat GMO soy, and cattle that eat GMO corn have severe health effects and die, then what happens to humans that eat GMO soy and corn, drink milk from GMO-fed cows, and eat beef from GMO-fed cattle? Don't we deserve more? If GMO killing fields are poisoning the animals whose products we consume, then they are poisoning us also. GMO killing fields are taking over our farms and stores, as well as our very lives. These silent, deadly killers have been hiding in anonymity since “1992...when George H.W. Bush...issued an Executive Order proclaiming GMO plants such as soybeans or GMO corn to be 'substantially equivalent' to ordinary corn or soybeans, and, therefore, not needing any special health safety study or testing” (Engdahl, 2006). Even labeling foods containing GMO ingredients is not allowed. With the proliferation of GMO ingredients, it is no wonder that companies do not want to be responsible for labeling their products. They probably do not know if what they are getting is GMO or not! How can you label something if you do not know what it is? The U.S. government, Monsanto, Dow, Dupont, and Syngenta are not in business to keep people healthy. They are in business to make money. Unless this is understood, these corporations will continue using the public as guinea pigs for their experiments in population control, and in so doing, glean ever-increasing profits from the unsuspecting and naive. It is time to stand up and resist these giants by demanding accountability, and using what resources are left to become self-sufficient and say NO WAY to GMO! If we don't, America's silent killing fields will do their job, and we will no longer have a choice. For full references, click here. GMO wheat, which was tabled by Monsanto because of farmer protests, is now back on the table, along with potatoes, rice, and sugar beets. In conducting the survey, the National Association of Wheat Growers (NAWG) approached in writing 21,000 farmers with a wheat cultivation area of at least 200 hectares. A third of those addressed participated in the poll. The object of the survey was the opinion of farmers towards a petition that was formulated by the NAWG and contained essential statements towards genetically modified wheat. Three-quarters (76 per cent) of the participating farmers agreed with the petition. NAWG approached 21,000 farmers. One-third, or 7,000 farmers participated. Out of that 7,000, 76%, or 5,320, approved of GMO wheat. 5,320 is only 25% of the 21,000 farmers originally approached. NOT A MAJORITY OF FARMERS! This statement is simply not true! The pollsters are twisting the statistics to suit their own purposes. What about the other 14,000 farmers, or two-thirds of all farmers who were not represented in the poll? Five years ago, the Monsanto company abandoned plans for the market introduction of genetically modified wheat, since many farmers feared losses in wheat export to Europe and Asia. "Our farmers still have no interest in herbicide-resistant Roundup wheat," declared a spokesperson of the NAWG. However, farmers demand increased yield and wheat types that better withstand heat, dryness and cold. As stated by the NAWG, "Our poll is a strong signal that farmers are ready to plant genetically modified wheat." Even bread made from conventional flour is likely to contain other ingredients derived from GM sources. Genetically modified ingredients: It takes more than just flour to make bread. Many ingredients found in bread and baked goods are sometimes made with the help of genetic engineering. Several ingredients often found in baked goods are derived from soybeans: oils, lecithin and other emulsifiers, and even soy flour, which is sometimes mixed with wheat flour in small quantities (up to 1 percent) due to its physical properties. Maize is the basis for various starches and other ingredients like glucose syrup (corn syrup), which is produced by starch saccharification.Other flour additives may also be produced with the help of genetic engineering, for example: ascorbic acid (E300) or cysteine (E921). We are facing a takeover so complete that it makes a tsunami look tame in comparison. Get your heirloom seeds and start a garden. Save the seeds and create your own seed bank. Do it now.